The EUR/USD is back wrestling with the highly psychological 1.50 level after breaking through the barrier yesterday. We view yesterday’s movement as an important technical development since we previously explained how 1.50 represents our final topside barrier before 1.55. Hence, we could be on the brink of another near-term breakout in the currency pair should tomorrow’s EU PMI data print well. On a cautionary note, headwinds are gaining strength due to growing psychological forces. The ECB has heightened its rhetoric regarding its concern about a weaker Dollar. Though the ECB is all talk right now, the central bank may become proactive should the Fed neglect to make a concerted effort to tighten its belt, so to speak. Meanwhile, China’s economic data came in around analyst expectations today and investors are a bit disappointed that there wasn’t a topside surprise as we’ve become accustomed to. Furthermore, hawkish sentiment is brewing once again in China since investors are becoming increasingly concerned that excess liquidity is creating asset bubbles. The change in tone is worth noting since investors are uncertain how a tightening of liquidity in China would impact the global economic recovery. However, the government appears content with its current monetary policy and a shift likely wouldn’t come until 2010. Today’s EU Current Account data certainly doesn’t allay fears that an appreciating Euro will choke the EU’s economic recovery. The sharp reversal in the Current Account shows exports are suffering due to a strong Euro and high unemployment in developed nations. Therefore, tomorrow’s PMI and German Ifo Business Climate data could determine whether investors are comfortable sending the Euro even higher despite psychological and now fundamental headwinds. Even though there are topside psychological forces beginning to work against the EUR/USD, investors should also take note that the Beige Book confirmed the Fed has no plans for tightening its own belt any time in the near future. Therefore, it seems the ECB will need to take action should it want to reverse the EUR/USD’s medium-term uptrend. As for the time being, the EUR/USD’s near-term and medium-term uptrends are intact and the remainder of the week is all about PMI data and Q3 earnings. Fundamentals would likely trump negative psychological forces should earnings continue to roll in positively while tomorrow’s PMI numbers top expectations. However, negative developments in either could send the currency pair reeling towards weekly lows. Meanwhile, investors should keep an eye on the S&P futures since they have failed to break through their psychological 1100 level. Any considerable downward pressure in U.S. equities would likely send investors towards the safe haven of the Dollar. Investors should pay particularly close attention to our 1st tier uptrend line and the psychological 1050 level. Overall, the markets are still trying to make up their minds regarding whether to continue this year’s impressive bull run. Technicals continue to support this belief, and until positive technicals deteriorate the EUR/USD’s uptrend is in place. Technically speaking, the EUR/USD’s topside barriers are the psychological 1.50 level, intraday highs, and our makeshift 3rd tier downtrend line. As for the downside, the currency pair has several technical cushions waiting nearby, beginning with our multiple uptrend lines along with 10/21 and 10/19 lows. The Cable is dipping after breaking through our previous 3rd and 4th tier downtrend lines and the psychological 1.65 level. We mentioned before how a failure of both our 3rd and 4th tiers signals a probable retest of September highs and possibly the highly psychological 1.70 level. The Pound continues to find strength in the BoE’s decision to stray from its overtly dovish monetary policy in light of recent optimistic econ data. After all, King’s previous hawkish sentiment was a leading factor driving the GBP/USD towards its October lows. Therefore, it’s reasonable to expect the Cable to flourish in a more neutral policy environment coupled with improving fundamentals. However, the BoE has yet to make a concrete action, and the central bank will likely need further fundamental confirmation showing that Britain’s economy warrants a tighter monetary policy before considering physically tightening the reigns. Speaking of fundamentals, Britain’s Retail Sales data printed 0% growth for the second time in a row, indicating the improvement in unemployment hasn’t yielded higher consumption. Moving East, China reported econ data that was altogether in line with analyst expectations. China’s inability to beat estimates has dented investor optimism a bit, though there shouldn’t be much of a hangover. More importantly, bankers and analysts are expressing their concern about excess liquidity again, and its possible China will need to tighten in 2010. However, it’s still 2009, and this type of speculation shouldn’t impact global markets too much unless government officials officially announce China’s express intent to take action. Meanwhile, all eyes are on Q3 earnings and tomorrow’s wave of econ data. U.S. earnings continue to top estimates, and this may drown out building psychological headwinds from the ECB and China. Britain will release its Prelim GDP and BBA Mortgage Approvals data tomorrow. Investors expect Prelim GDP to turn positive along with a steady improvement in Mortgage Approvals. Additionally, the EU’s PMI data should carry some weight since the last PMI wave signaled a cool down in Germany. Technically speaking, the Cable’s in good shape and a test of September highs in the near-term seems probable. The EUR/USD briefly ventured beyond 1.50 and the AUD/USD continues to climb higher. The big development to watch is the S&P’s 1100 approach. Should the S&P futures break beyond 1100, we can expect a corresponding rally in the risk trade. We’ve created a makeshift 4th tier downtrend line for the Cable to serve as a topside barrier along with 9/15 and 9/11 highs. As for the downside, the Cable’s impressive ascent has created quite a few technical cushions, including our 4th tier uptrend line along with the psychological 1.65 level and intraday lows. The USD/JPY is popping after Japan’s Trade Balance came in much lower than analyst expectations coupled with a downward revision of the previous release. Analysts are eager to point out that Japan’s exports declined at a slower rate. However, the Trade Balance still took a hit, telling us the improvement in imports far exceeded that in exports. The USD/JPY is climbing in reaction to the unexpected outflow of Yen in conjunction with a rally fueled by oversold conditions. The USD/JPY has managed to separate itself from 90 while climbing past our 1st and 2nd tier downtrend lines. However, topside volume is fading and the currency pair still faces our 3rd and 4th tier downtrend lines along with 9/21 highs. Meanwhile, there are many downtrend lines we can construct beyond these barriers due to the currency pair’s extensive deterioration over the medium-term. Therefore, we are cautiously optimistic and will need further topside confirmation before considering revising our outlook on the USD/JPY over the longer-term. As for the downside, the USD/JPY continues to create breathing room. 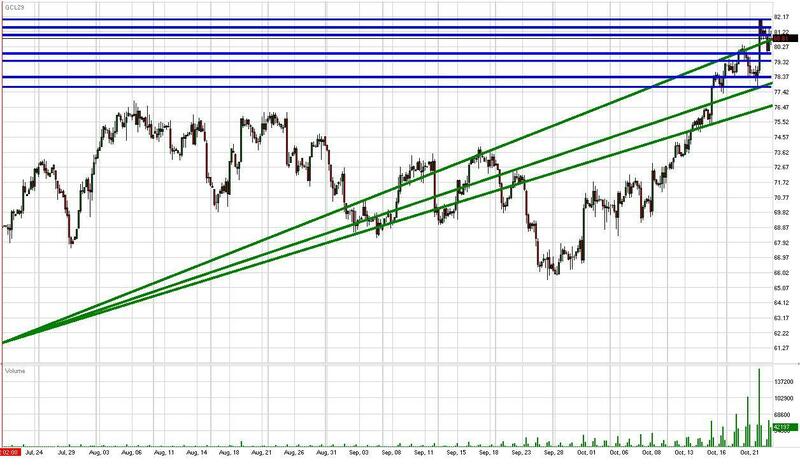 We find cushions in the form of our 3rd tier uptrend line along with 10/21 lows and the highly psychological 90 level. Meanwhile, all eyes will be on tomorrow’s wave of EU and British econ data long with continued Q3 results. The USD/JPY’s correlation with U.S. equities it’s a bit out of whack these days. However, any broad-based favoritism of the risk trade would likely benefit the USD/JPY’s uptrend. Considering the GBP/USD and EUR/USD have limited topside technical barriers, the USD/JPY’s present run could have more room to go over the near-term. Gold continues to consolidate around the psychological $1500/oz level while setting lower highs and higher lows. This pattern tells us there is a wedge forming, which is why we installed a downtrend line. Gold’s sideways movement reflects investor indecisiveness in terms of whether to keep the risk rally rolling. Analysts and bankers are barking from both sides as doubt creeps back into the broader market. However, Q3 earnings are beating expectations and although econ data has been negatively mixed, it’s solid nonetheless. Meanwhile, the Fed’s Beige Book shows the central bank is not even close to tightening liquidity, meaning Dollar’s near-term downward trajectory is intact. However, the ECB is getting antsy and may opt to take some dovish action should the EUR/USD breakout to the topside again. On the other hand, actions speak louder than words, and overall central banks continue to gravitate towards a more hawkish monetary stance. This is good news for gold’s near to medium-term outlook since the precious metal is negatively correlated with the Dollar. All eyes will be on the EUR/USD’s interaction with 1.50 and the Cable’s ability to separate itself further from 1.65. We recognize consolidation in the AUD/USD and technicals continue to favor the topside in all of these currency pairs. Therefore, gold’s present consolidation is not necessarily a bad thing since the process develops a new support base should investors decide to extend the precious metal’s rally towards $1100/oz. The EU will be releasing a wave of PMI numbers tomorrow to go along with Britain’s Prelim GDP and America’s Existing Home Sales data. Therefore, gold and the FX markets could experience heightened volatility as the week comes to a close. Technically speaking, gold faces topside barriers in the form of our downtrend line along with 10/21, 10/20, and 10/14 highs. As for the downside, gold has our 1st and 2nd tier uptrend lines serving as technical cushions along with 10/21 and 10/16 lows. Additionally, the psychological $1500/oz level should continue to play a lead role as long as it’s in the picture. The S&P futures have recovered from earlier losses and are floating around nil as more strong Q3 earnings counterbalance discouraging unemployment data. Weekly Unemployment Claims rose by 15k and the economic indicator continues to descend at a snail’s pace. The slow improvement in unemployment keeps the Fed stuck in neutral since it would be premature to raise rates. Hence, the Dollar continues to experience selling pressure as investors use the Greenback as a funding currency. The Fed’s Beige Book confirmed the central bank’s inability to fight a weakening Dollar. However, bankers are rumbling in the EU and China concerning the need to loosen and tighten their respective monetary policies. Therefore, central banks are becoming active again after a relatively neutral past few months. Such activity implies volatility and uncertainty in the FX markets. Overall, the Dollar’s downward trajectory is intact until a large monetary shock hits the markets. Speaking of China, investors are a bit disappointed that today’s econ data didn’t zoom past estimates like usual. However, investors shouldn’t be clouded by raised expectations since Chinese economic data continues to make considerable improvements in light of the global economic condition. On the other hand, China’s loose monetary policy is a cause for concern over the medium-term and the question becomes not if, but when the government will intervene and begin draining liquidity. Fortunately for bulls, the economic recovery is still viewed as being in a fragile state, and its doubtful China’s domestic demand can make up for the massive decline in export demand. Therefore, China may have to wait with the Fed until U.S. unemployment and consumption improve so that China’s economy can handle the loss of liquidity. Therefore, despite the monetary policy chatter present market trends are intact until further notice. Meanwhile, the impressive flow of Q3 earnings should help silence critics since investors will speculate the improvement in corporate performance will ultimately lead to lower unemployment. Therefore, unemployment is being treated more as a lagging indicator in light of positive earnings. However, sore spots obviously remain in the U.S. economy, most notably the exposure of banks to souring consumer debt and the floundering commercial real estate market. Flying under the radar is the possibility that Morgan Stanley will hand over Crescent to Barclays, indicating commercial real estate is turning into more of a burden than an asset. Regardless of disconcerting economic developments, the Dollar’s downward trajectory bodes well for the S&P’s uptrend due to their negative correlation. A breakout in the EUR/USD beyond its highly psychological 1.50 level could yield a similar movement in the S&P futures past 1100. Additionally, crude has popped above $80/bbl while the Cable separates itself from 1.65. Therefore, the S&P’s correlations continue to create an environment favorable for further gains in U.S. equities. All eyes will be on the wave of EU PMI data tomorrow along with Britain’s Prelim GDP. Investors will be looking for an improvement in Germany’s PMI numbers along with a turn to the positive in Britain’s GDP. Additionally, the U.S. will release Existing Home Sales data and Bernanke will address the general public. Therefore, it seems the week may finish with volatility. Technically speaking, the S&P futures face topside barriers in the form of our 2nd tier uptrend line, 10/21 highs, and the highly psychological 1100 level. As for the downside, the futures have technical cushions in the form of our 1st tier uptrend line along with the psychological 1075 and 1050 levels. Our 1st tier uptrend line plays an important role since it runs through previous October lows. Crude futures barreled past $80/bbl and our 3rd tier uptrend line on a surge in volume as the Cable logged large gains and weekly gasoline inventories shrank. Therefore, crude’s exciting near-term gains have toppled their latest technical barrier as anticipated after eclipsing our important downtrend lines and the psychological $75/bbl level. Meanwhile, the Dollar’s downward trajectory is intact after the Fed’s Beige Book confirmed that the central bank has little intention of raising rates in the foreseeable future. Meanwhile, the GBP/USD has leapt past important topside technicals and the EUR/USD is contemplating leaving behind 1.50. Hence, crude’s positive correlations are creating an environment supportive of further gains in commodities. Therefore, we presently have little reason to alter our positive trend outlook on crude. The next key for crude will be the S&P’s ability to shrug off disappointing unemployment data and negative psychological headwinds to overcome 1100. Any movement in the S&P futures beyond 1100 would likely result in exciting near-term gains in crude. However, U.S. econ data has been flowing in mixed lately so the S&P futures face an uphill battle. U.S. housing data will have an opportunity to redeem itself tomorrow with an Existing Home Sales Release. Additionally, the EU will release a wave of PMI data along with Britain’s Prelim GDP. The EU’s PMI numbers will be in focus since an increase in production results in higher demand for and consumption of crude. Meanwhile, investors should eye the EUR/USD’s interaction with 1.50 and gold’s struggle with $1050/oz. A break out in either investment vehicle should yield further gains in crude due to the influence of correlations. We can find only find weak technical barriers for crude, including 10/21 highs and the psychological $85/bbl. As for the downside, crude has technical cushions in the form of multiple uptrend lines along with 10/21 and 10/16 lows. Additionally, the psychological $80 and $75/bbl levels are now working in crude’s favor.